"Scour the Hive Fortress for a chamber where The Speaker believes a dark ritual is silencing The Traveler." Chamber of Night is a story mission that takes place on the Moon. The Speaker: Nothing is more important now. We believe the Hive are engaged in a ritual that is draining The Traveler of its Light. Whatever power they wield must be understood... and destroyed. Ghost: This ritual could be happening in any one of their thousands of chambers. If we can find cracks deep enough, I can map the entire Hive fortress. The Guardian scans a crack in the ground. Ghost: Okay, good scan, but not enough to locate the ritual yet. Let's keep looking. The Guardian scans another crack in the ground. Ghost: Hold on. I got it. But we have to go deeper into the Temple of Crota. The Guardian approaches the Temple of Crota. Ghost: Someone's trying to establish contact. Could be The Speaker. Heavily distorted radio static. Mostly white noise. Ghost: No luck. Too much interference. Ghost: Let's get out in the open. I'll have a better chance of locking this signal. The Guardian reaches the Temple of Crota. Exo Stranger (radio): You're interesting. Not entirely interesting, but... you have promise. Ghost: I don't know; I'm losing the signal. Exo Stranger (radio): Guardian, I know what you're about to do. It's brave. But there are enemies out here you would not believe. Exo Stranger (radio): Go down and face the Hive, and if you live, come find me. Ghost: Signal dropped. I got some broken coordinates—Venus, Northern Hemisphere. Ishtar region. Great. What do we do now? The Guardian heads deeper into the Temple of Crota. They reach a Hive Seeder. Ghost: Hive Seeder, just like the ones invading Earth. If we don't finish this, there'll be more of these hitting home. The Guardian reaches the Chamber of Night. Three Siphon Witches are gathered around a large object in the center of the room floating in mid-air. The object has a dark aura around it. 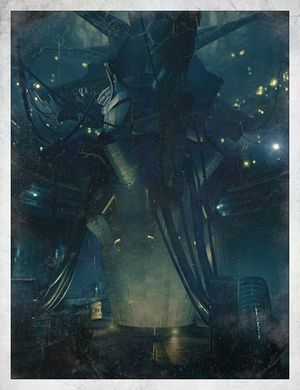 Ghost: Here it is, the darkest of all the Hive's chambers. The Guardian kills all of the Hive enemies and deploys the Ghost at a nearby terminal to scan the large object. Ghost: What is this thing? It's a shard of the Traveler! The dark aura disappears from the object. Ghost: They were using it against the Traveler, devouring its Light. But we freed it. And our new friend said there are enemies on Venus worse than this? Great.